Swiss Champ XAVT - Ruby Model # 53509 1.6795. Saying the SwissChamp XVAT includes all of the tools you could need in any situation is an understatement. If you're looking for a tool that has it all, the SwissChamp XAVT is the answer! Bit Hex 5 mm female for D-SUB connectors. 4 mm female Hex drive for the bits. THE ORIGINAL SWISS ARMY BRAND. 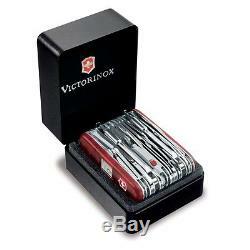 In 1897 the Original Swiss Army Knife was created in the small village of Ibach, Switzerland. Since that time, Victorinox has become well-known in more than 100 countries for precision, quality, functionality and versatility. Uncompromising craftsmanship makes these Knives worthy to carry the "cross and shield" emblem that symbolizes the legend of Victorinox and the Swiss Army Brand. Whether you're going around the corner or around the globe, classically styled Swiss Army will make sure that you're equipped for life's adventures. No matter what those adventures might be.